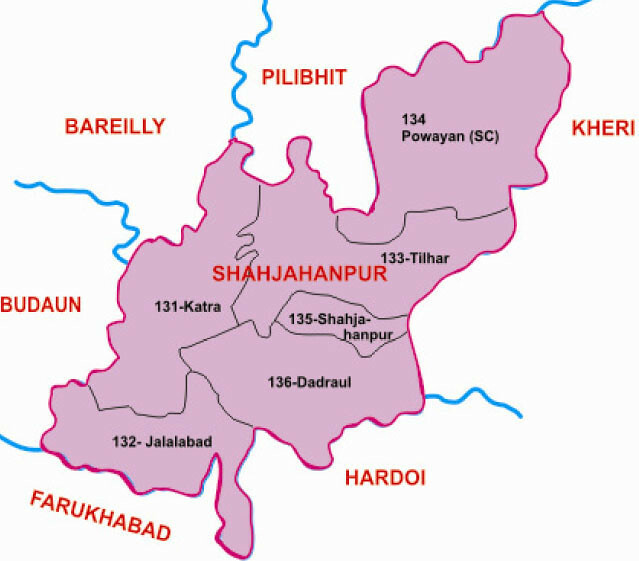 There are six legislative assembly constituency in Shahjahanpur district for the 2017 Assembly elections. They are 136 Dadraul, 132 Jalalabad, 131 Katra, 134 Powayan, 135 Shahjahanpur, 133 Tilhar. When Uttar Pradesh assembly election 2017 is getting ready to electios new Assembly, Shahjahanpur is not anywhere behind in the election heat. Shahjahanpur district is one of the historical districts of Uttar Pradesh in the republic of India. It is a part of Bareilly division which is situated in south-east of Rohilkhand division. It was established in 1813 by the British Government. Previously it was a part of district Bareilly. Geographically the main town is Shahjahanpur city which is its headquarters. Its Tehsils are: Powayan, Tilhar, Jalalabad, and Sadar.